"These are the students that we were waiting for," said one advocate whose mother survived the shooting at Sandy Hook. 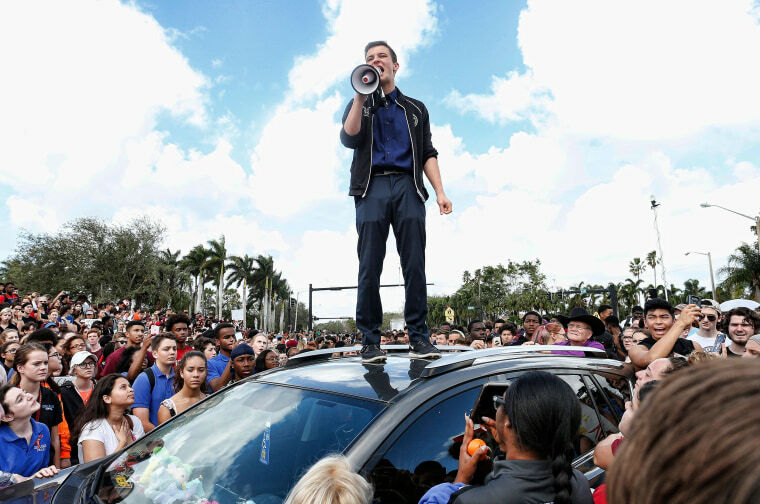 For the students of Marjory Stoneman Douglas High School, channeling their grief and anger into lasting advocacy is something they're learning on the fly. But if and when they do need advice or assistance, there are survivors of previous mass shootings and more established groups willing to assist with that education. Many see the Parkland teenagers as a major new force in the gun control debate, ever since the Feb. 14 mass shooting that killed 14 of their classmates and three of their teachers. "These are the students that we were waiting for," gun control organizer Sarah Clements, 22, told NBC News. She volunteered for the cause after her mother, a former second-grade teacher at Sandy Hook Elementary School, survived the 2012 mass shooting in Newtown, Connecticut. "They are the voices we all needed to make actual change happen, so I feel a tremendous responsibility," Clements said. "If I can do anything to help mentor them or help them heal, then that is what I can and should do." Just two days after gunfire erupted at Stoneman Douglas, Nicole Hockley, who lost her 6-year-old son Dylan in the 2012 Newtown shooting, flew down to Florida to console the families just starting to experience the staggering grief that she's felt for the past five years. "I just felt a need to be there," Hockley said by phone after arriving in Washington ahead of Saturday's Parkland student-organized March For Our Lives. "I wanted to be helpful. There’s no playbook for what to do next as a community. "Stopping by the hospital, seeing the grief, seeing so much media, it felt so much like the early days of Sandy Hook," recalled Hockley, who co-founded the non-profit Sandy Hook Promise. "What I wasn’t prepared for is how many memories came flooding back." In the weeks since, after speaking to Parkland student leaders like Sam Zeif, who she met at a Feb. 21 White House audience with President Trump, however, Hockley gained a different perspective. "I look at them like a mother and I want to protect them, and help them go forward," she said. "But this is 100 percent their movement. They own this, they're not being told what to do." As the Parkland teens begin gathering for Saturday's march, adult advocates have kept step. Everytown for Gun Safety, for example, launched a $2.5 million grant program to help "sibling marches" in other cities around the country on that day. "These kids are super savvy, really good with social media at an age where you can be angry, passionate around issues," said Shannon Watts, the founder of Moms Demand Action, the nation-wide grass-roots arm of Everytown. "That’s an incredibly powerful and moving force. I’m very hopeful that this is a generation that will run for office." They have also reinvigorated other generations. Since the Feb. 14 shooting, more than 140,000 Americans have reached out to volunteer with Moms Demand Action, according to the organization, and another 1.7 million pledged support online. Because the group already has a nationwide network in place, they can put fervor into lobbying for universal background checks and bans for domestic abusers at the statehouse level. All of that is greatly appreciated by the Stoneman Douglas survivors themselves, but "we are all trying to keep this student led," said senior Suzanna Barna, 17. Barna, who huddled in a closet with 19 classmates for nearly two hours until a SWAT team arrived, later learned she lost her friend Carmen Schentrup in the massacre. She has since leaned mostly on her peers as she founded a letter-writing campaign directed at politicians who support the National Rifle Association. "We have to take advice from those who have more experience. But at the end of the day, it has to be our own voices," said Barna. The six weeks since the Parkland shooting have been a watershed for the movement as a whole, in large part because of the students' ability to put the NRA on the defensive in the all-important public relations battle. A March 1-8 Gallup Poll found 67 percent of Americans wanted stricter laws for firearm purchases, the highest total since 1993. "It's a lot harder for any adult to hear a teenager ask for help and not feel moved," said Hockley. With each shooting death since Feb. 14, they are also part of a fellowship that just keeps growing in number. Barna recently reached out on Twitter to a grieving survivor of Tuesday's shooting at Great Mills High School in Maryland to lend her support. "We're definitely all linked together," said Barna. "They are having all of the same thoughts we have been having."